How many of you have ever wished , or wish, that you were someone else? I spent months and years wishing I was taller, thinner, blonder, prettier, more patient, a better singer, independently wealthy, etc., etc., etc. I wasn’t “at ease in my own shell” and wanted out! 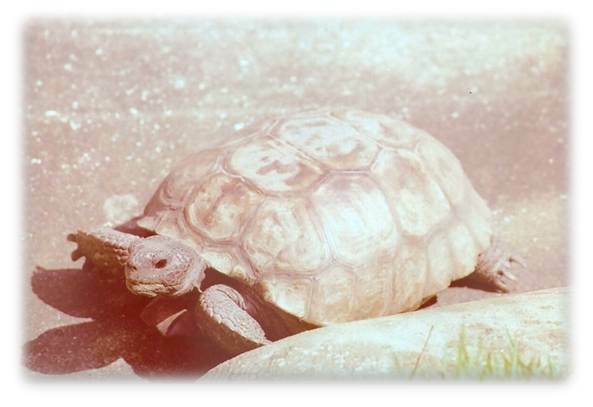 To me, a turtle is “slow, heavy, carrying around a big burden, born looking old, a loner”. Every now and then we see “General Patton”, a gopher turtle that lives in the conservation area around our neighborhood. He is always alone, looks ancient and just plods along. Let’s face it, he’s not the most glamorous of God’s creatures. We live in a fast-food, instant messaging, 24/7, 4G world – turtles can’t keep up with the pace … they’ll get run-over, won’t they? 1. Turtles have a “shield of protection” from all predators, all the time. • My choice is the strongest shield of all – the Lord, Jesus Christ! 2. Turtles are cold-blooded, which means they control their temperature through external means, are able to function over a wide internal temperature range. • Enjoy the warmth of basking in the sun, the warmth of holding someone dear close, the warmth of a smile. • Try to be flexible and adaptable across wide “temperature” ranges. This isn’t easy when the “wide temperature ranges” include changing circumstances and people. 3. Turtles are slow movers. • Remember who won the race in “The Hare and the Tortoise”? “Slow and steady progress wins the race”. 4. Turtles have good eyesight and excellent sense of smell. • Enjoy the colors and splendor of the living creatures, plants and people around you. Stop and smell the roses or lilies or magnolias or fresh-baked chocolate chip cookies! 5. Turtles can’t crawl out of their shells. • In the famous words of Popeye, “I ‘yam what I ‘yam”. You are stuck with yourself, so you might as well enjoy and “be at ease in your own shell”!! Remember to “Bea Positive” and share your “positive” spirit with others – it really is contagious!